This necklace from Carrie Elspeth is made from translucent Agate which is dyed in different colours and has a crackle effect running through the stone. The semi-transparent Agate beads are combined in colours ranging from greens and blues to warmer blues and purples. The necklace looks wonderful when worn with colourful clothes and can also be worn with great effect to highlight a simple dark outfit. On this necklace the beads are gathered into one section while the rest of the necklace is left plain for dramatic effect. 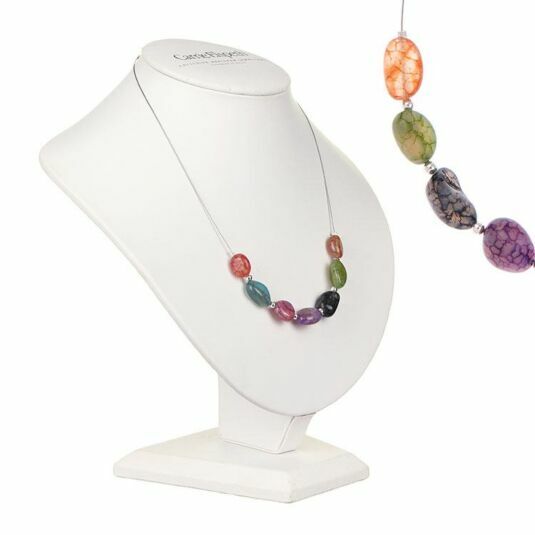 Beautiful agate, dyed in a variety of gorgeous colours makes ‘Crackle’ a stunning statement piece. Because of the nature of the stones every bead is unique and the jewel-like colours make the necklaces and bracelet statement pieces which work with any outfit! Carrie considers the necklace to be the flagship piece of each of her sets, and it’s easy to see why, since the detail conveyed by a necklace shows all the key elements in a range, including colour, detail and type of bead. This necklace is approximately 17" (43cm) long and fastens with a silver-plated spring clasp, but can be extended by a further 5cm thanks to the 2'' silver-plated extension chain which finishes the necklace. The beads are in colourful earthy shades, made from natural Agate which has been dyed. A beautiful piece of jewellery in its own right, this necklace is also designed to work with the matching bracelet to bring the whole set together. The crackle collection is one of my favourites this summer! Each unique stone is simply gorgeous and being interspaced with the silver spheres really makes this collection a timeless classic. I adore the entire range and have hardly taken it off!